Harm reduction is a set of strategies designed to lessen the negative social and/or physical consequences associated with high risk behaviors. A harm reduction philosophy embraces a range of approaches, from abstinence to safe use. 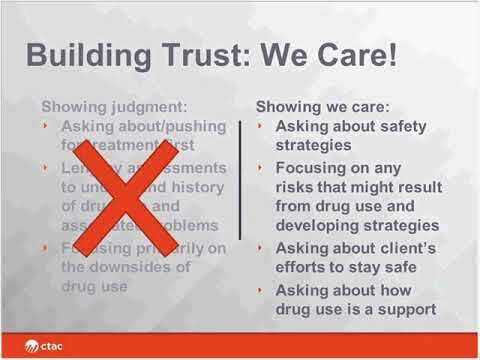 The philosophy is most known for program models that address risky substance use (such as syringe exchange, Naloxone distribution, and opioid treatment programs), but can also be applied to other high-risk behaviors. This webinar will explore harm reduction approaches in more depth, with specific attention to situations when a person is not interested in abstinence or complete elimination of risk. While the discussion will focus on substance use behaviors, the use of harm reduction in a variety of settings for both young people and adults will also be explored. Our presenters, Jenna Tine and Naomi Weinstein, will participate in a mutual discussion to inform professionals working in behavioral health, child welfare, housing, health homes, and other settings who often support people engaging in high risk behaviors. The presentation will also include time for questions from and dialogue with the audience. Jenna Tine, LCSW, is currently the Senior Vice President of Outpatient Services at The Bridge, Inc. where she oversees the agency’s Clinical Hub providing recovery-focused, person centered, harm reduction services for individuals with mental health and substance use diagnoses. Jenna was previously the Senior Vice President of Behavioral Health Services at Goodwill Industries of Greater New York and Northern New Jersey, Inc. and was responsible for two Personalized Recovery Oriented Services (PROS) Programs, two accredited Clubhouses, a Peer Advocacy Leadership Program, and several other programs. Jenna started her career as an ACT Team Substance Use Specialist at Pathways to Housing, an agency that led the way in providing Housing First and Harm Reduction services to individuals with histories of chronic homelessness, and co-occurring substance use and mental health diagnoses. After her five-year career at Pathways to Housing, Jenna entered hospital administration as the Program Manager for the Acute Division at St. Luke's Roosevelt hospital, overseeing adult inpatient units and Comprehensive Psychiatric Emergency Programs. Jenna has also worked throughout her career as a consultant for a number of syringe exchange programs in NYC focusing on clinical supervision, program development and the transition to Medicaid Managed Care. Jenna also worked with homeless and at-risk LGBTQIA youth for 10 years at a Saturday evening program that provided crisis counseling, meals, and other basic needs through a harm reduction approach. Naomi Weinstein, MPH, is the Vice President at Innovations at Institute for Community Living (a MCTAC and CTAC partner), where she focuses on training and clinical excellence. Ms. Weinstein has a long-standing interest in the needs of vulnerable individuals and families, and has extensive experience developing and managing training, education and technical assistance programs for mental health, substance abuse, child welfare and family court. Ms. Weinstein is the author of numerous curricula and other clinical resources, and has a special interest in curriculum development. Prior to ICL, Ms. Weinstein worked at the Coalition of Behavioral Health Agencies, where she directed the Center for Rehabilitation and Recovery, and at Phoenix House’s Center on Addiction and the Family for 15 years. Ms. Weinstein has a Master’s in Public Health from Columbia University.